Coptic is the ancient language of the Egyptians. Egyptians substituted the hieroglyphic scrip with an alphabet derived predominantly from the Greeks. The word Coptic has its etymology in the word Aigyptos (Greek noun for Egypt). This word was used to refer to the Egyptians as distinct from the Hellenists and other foreigners at that time. The word “Coptic” today refers to both a language and to Egyptian Christians. The Coptic Orthodox Church (a.k.a. the Church of Alexandria) is one of the oldest Apostolic churches in the world. There were originally five ancient Apostolic Churches established in Jerusalem (where Christianity began), Alexandria, Rome, Antioch and Constantinople. St. Mark the Evangelist, author of the Gospel of Mark founded the church of Alexandria around 61 A.D. He was the first Coptic patriarch of the Church of Alexandria and was martyred in 68 A.D.
After the martyrdom of St. Mark, the Coptic Church enjoyed an almost unbroken peace until the early third century. As Christianity grew, the attempts to quash it became fierce. The Coptic Church is recognized as having suffered one of the most violent waves of persecution in Christian history and thus our Coptic Calendar commences at the beginning of the reign of Roman Emperor Diocletian at whose hands thousands of Christians died. The Coptic Synaxarium (a book that details the history of the saints, their miracles and other notable events) and the Lives of Saints represents only a fraction of martyrs who died for the sake of Christ. The book is used in the Liturgy to commemorate this history and provide a living example of saints who championed the faith. One of the early and most prominent contributions of the Coptic Orthodox Church to Christianity is the monastic life. St. Antony, known as the father of monasticism, was a Copt from Upper Egypt. His life was recorded by St. Athanasius the Great, who was the 20th patriarch of the Coptic Orthodox Church and who was an architect of the Nicene Creed, which is the foundation of Christian belief. The monastic order based on principles of poverty, obedience and chastity, became the foundation from which many western orders are based. Today the Coptic Monastic life is vibrant and there are over 33 monasteries and 6 convents in Egypt and all around the world. The Coptic Church believes in One God. The Bible and personal experiences teach us that God has three hypostasis: Father, Son, and Holy Spirit. No Hypostases is higher than the other, yet all exist as One, just as the Sun is a sphere, emits heat and begets light. The Copts retain Christ’s teachings to the Apostles in conformity with the Bible that to obtain salvation and live eternally one must both have faith and comply with God’s Sacramental requirements, that are the means of Grace. Christ set forth the Sacraments upon His Apostles and they can only be administered by the Church. A mystery (aka a Sacrament) is an invisible Grace (by the Holy Spirit - God Himself) given through a visible (material) means. The mysteries can only be administered by a canonical priest. God Himself ordained the first priests and bishops when the Holy Spirit was given to the Apostles, conferring authority to administer mysteries and to ordain others to do so after them. A priest does not have authority from God to administer Mysteries unless they derived their ordination from the Apostles. More information about the Coptic Church's Sacraments can be found here. The School of Alexandria was the earliest and most important institution in of theological learning in the Christian antiquity. It grew tremendously in the first four centuries of the world. After the Roman Empire officially accepted Christianity in 313 AD, Alexandria became a renowned center of learning especially in theology. The School was essential in the education of both recent converts and future patriarchs of Christianity through the world. Many of the great deans of the school include St. Clement of Alexandria (c.150‐254 AD) a gifted author, Oirgen (185 AD‐264 AD) the brilliant scholar; and St. Didymus the blind, who formed a system of engraved writing for the blind, fifteen centuries before Braille. As a result of this great tradition of theology, there arose a number of theologians who were well respected and recognized in the Christian world. Many of these scholars played a critical role in the development of Christian theology in the three recognized Ecumenical Counsels of Nicaea (325 AD), Constantinople (381 AD) and Ephesus (431 AD). While still a young deacon at Nicaea, St. Athanasius defended the Divinity of Christ and was one of the writers of the Christian Creed, which is followed by most Christians today. Another Egyptian sage was St. Cyril of Alexandria who stressed the unity of the Divinity and Humanity of Christ in the third Council of Ephesus (431 AD). Although the Coptic Church has been unjustly labeled as being “Monophisite” (believing in only one nature of Christ), St. Cyril explained centuries ago that the Coptic Church believes in one incarnated nature of God, the Word, that is one union of two natures: one fully human nature and one fully divine nature. In Egypt today, where Islam is the major religion, Coptic Orthodoxy comprises about 15% of the population. There are over 10 million Copts throughout the world Including Europe, North America, Australia and Asia. The Coptic Church is flourishing in the United States. Evidence of this is seen by the number new Churches established every year throughout the America. There are a number of notable events in the recent history that have greatly expanded the reach of the Coptic Orthodox Church. In 1994 the British Orthodox Church was received into the Patriarchate of Alexandria. 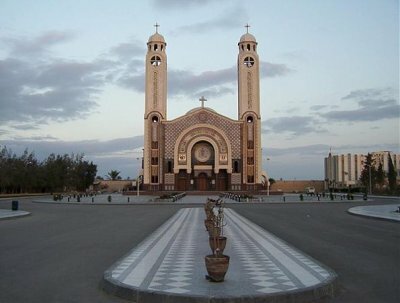 In 1991, the First Coptic Orthodox Churches were established in South America, one Brazil and one in Argentina. Moreover the Coptic Church has grown through its missionary work in Africa. 1976, His Holiness Pope Shenouda ordained Bishop Antonious Markos to commence missionary work among the African tribes in Kenya. In 1979, His Holiness made a pastoral visit to Kenya, Zaire and Congo. His Holiness was very keen to extend the Apostolic Mission of St. Mark across the world and spread the Christ’s message to all in every place regardless of race, ethnicity, language and culture.